I spent my first year after high school in a fairly well supervised school dorm. Lunch was provided to us at school, and suppers were served in a large lunch room in the second floor of the school building. Breakfast was where we had a little leeway. Each Sunday we had to give in a grocery list of items we wanted for the week’s breakfast. The list was typically comprised of bread, fruit, oatmeal and cereal. Snacks, however, weren’t provided by the school. Necessity, they say, is the mother of invention. And as poor students, there was certainly a necessity for free snacks. So we got creative. We improvised. We discovered that the folks in charge of our grocery order didn’t differentiate between bran flakes and other such healthy cereals and total junk. And so, by way of having our school buy us snacks, we included all kinds of sugary, junky, completely nutrition-less cereals. And at night as we sat around doing who-knows-what teenage girls do, in lieu of popcorn, pretzels and potato chips, we ate cereal. Our favorite was Reese’s Peanut Butter Puffs. We ordered boxes of it every week, and consumed it into the wee hours of the night. It’s definitely a delicious cereal. It’s got that magical combination of peanut butter and chocolate, but for me, there’s more to it. For me, this cereal will always be associated with our clever method of free snacking, with sitting on that horribly ugly beige couch, snacking until the most ridiculous hours of the night. So recently, when I noticed this cereal in the grocery store, I knew I had to turn it into a cookie. 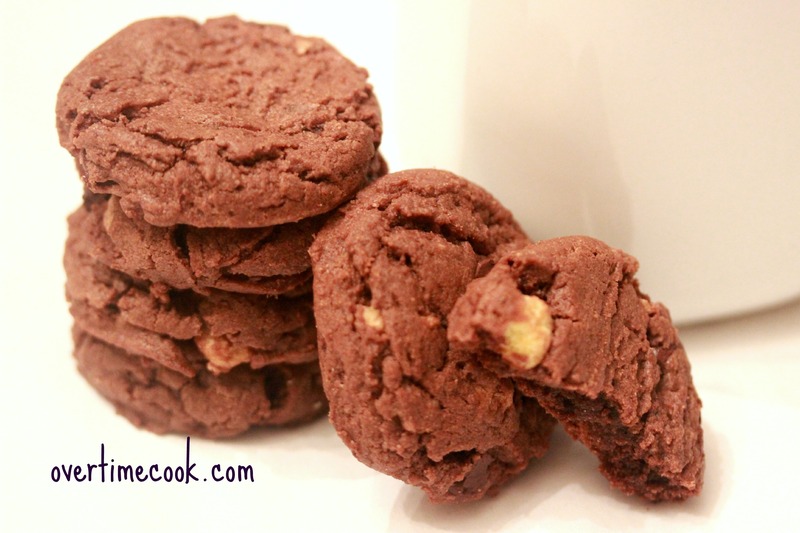 These are Chocolate Peanut Butter Crunch Cookies, but a part of me will always think of them as Nostalgia Cookies. Do you have any foods that are strongly associated with a specific memory? Preheat oven to 375. Lightly grease a cookie sheet with parchment paper. In a small mixing bowl, whisk together the flour, cocoa powder, baking soda and salt. Set aside. In the bowl of an electric mixer, cream together the butter and peanut butter for about 30 seconds until combined. Add granulated sugar and brown sugar and beat until creamy. Add vanilla extract and eggs, beating well to combine after each addition. Turn mixer to low and slowly add the dry ingredients. Beat until just combined. Stir in the (slightly) crushed cereal and chocolate chips. Scoop the cookie dough using a medium cookie scoop, or drop by tablespoon onto the prepared cookie sheets. Bake at 375 for 9 minutes, of until tops are just set. Remove from oven and let cool on cookie sheets for a couple of minutes before removing to a wire rack to cool completely. Chopped up peanut butter cups would probably be delicious, but they have a whole different texture. Try another cereal (such as cocoa puffs) to get a crunch. How fun to make cookies out of your favorite cereal! Just discovered a new love for crunchy cereal in cookies. This is a whole new world! Also, I have so many foods associated with specific memories it is not even funny! Loved your story and the cookies look delicious. Imagine if you had these to snack on back in your school days! 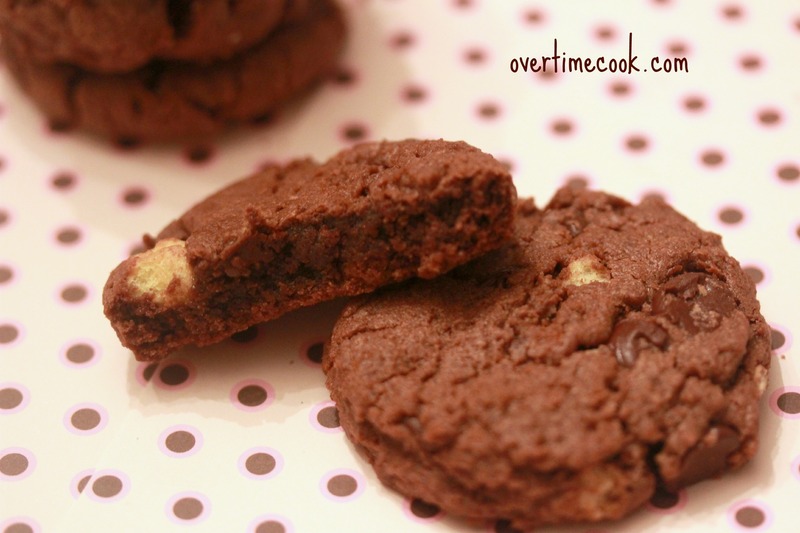 Mmmmmm….I have a fondness for pb cookies, so I can only imagine that cocoa and chocolate chips makes them even better! Lol Miriam those were the days!!! Btw was soo cool to see you featured in the Ami this week…I can’t wait to try out those brownie fudge hamantashen! Can these be made but vanilla cookies instead of chocolate? Can the margarine be substituted with oil?